An exceptional war-time relic, the present timepiece can arguably be counted amongst the ultimate examples of military pilot timepiece. In the 1940s, the German Air Force, or Luftwaffe, commissioned watches for their pilots from manufacturers such as IWC, Laco, Stowa, Wempe, and A. Lange & Söhne. Produced to the Luftwaffe's specifications, the watches would all have a mechanical movement with centre seconds, and cases measuring 55mm to accommodate the large movements, which were typically used in pocket watches, and to allow for maximum legibility. The watches would all be fitted on an extra-long leather strap so they could be worn over a flight jacket. The oversized crown could be operated with gloves on, and one would be able to stop the central seconds for precise time-setting. The movement would be surrounded by an iron core, to protect against magnetism. These watches became known as the B-Uhr style, abbreviated for Beobachtungs-uhren, or "Observation" watch. The B-Uhr had two dial variations - Type A dials featured a standard outer minute track and large triangle at 12 o’clock, and Type B - exemplified by the present watch - with an inner hour track and outer minute track. "FL23883" was graved on the left side of the band to identify the watch as one designed for navigation. On the inside of the case back, it contained further identifying numbers and information: type (Bauart), production number (Werk-Bez. ), and order number (Anforderz). 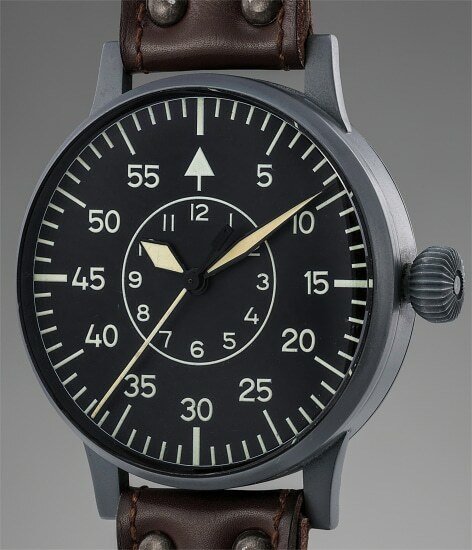 As the watches were the property of the Luftwaffe, and not of the individual navigators, the pilots had to return their watches after completing their service, thus enhancing their collectability today. Finding a new-old-stock example such as the present one is unimaginably difficult as these pieces were intensively used, making this example virtually unique.